Thanks for all your comments and private emails regarding our recent blogs. In this newsletter we introduce a new/old tangle - flux, and share some additional treats and awards. We just recently realized we have not publicly taught flux in our newsletter as yet! 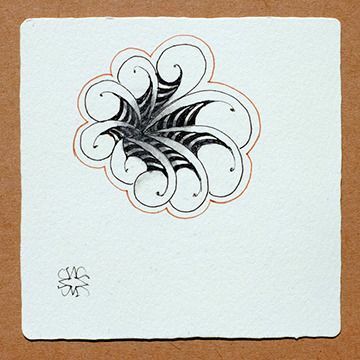 We taught flux from the very beginning of Zentangle. 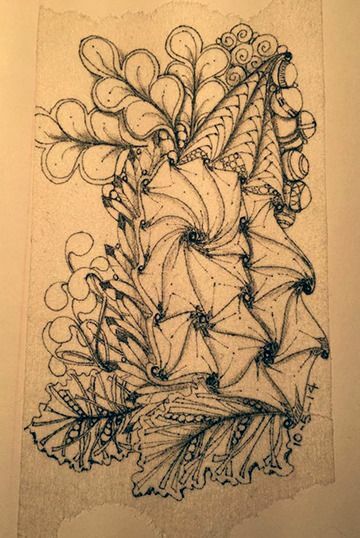 Maria learned the inspiration for this tangle at a calligraphy class she took about 25 years ago. 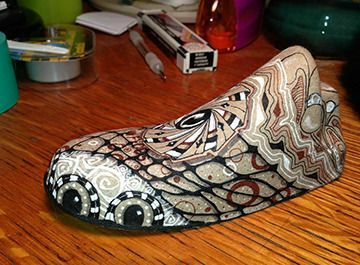 And if memory serves (which it often does, albeit reluctantly), Maria was drawing this patterns on that magical day when I interrupted her in her studio which sparked this amazing Zentangle adventure. 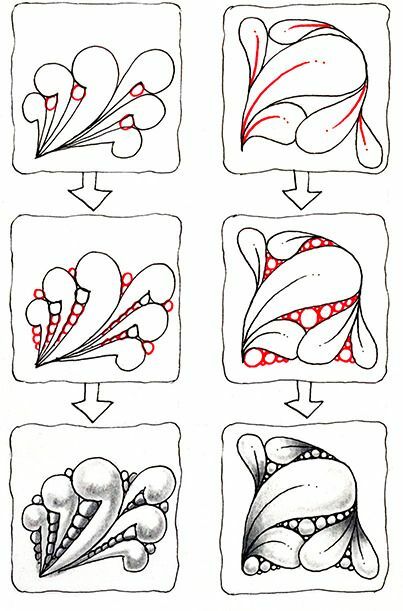 What's really funny is depending on who you ask, Rick or me, you get a somewhat different idea of how to draw this wonderfully "flourishy" tangle. Our daughter, Martha, certainly named this tangle appropriately! You get to choose how you want YOUR flux to look like . . . flux.version.Maria, flux.version.Rick, or flux.version.Yours! 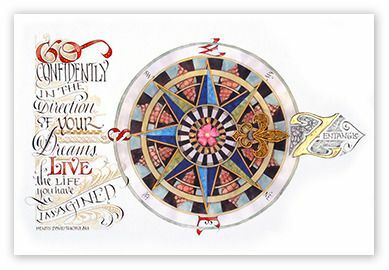 Maria's version draws inspiration from a traditional filagree pattern often found in old illuminated manuscripts and books. 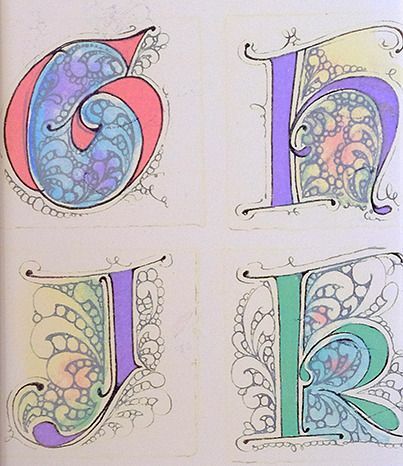 I just took this picture of part of an alphabet she designed about fifteen years ago for a commercial client. 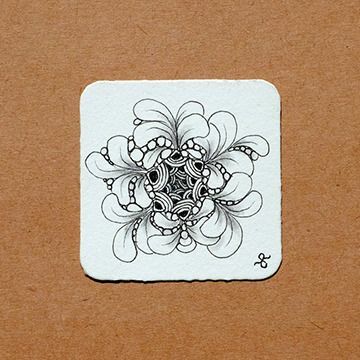 I love how our Zentangle Method was inspired by the rich design language of humanity and nature and continues to "draw" on this seemingly infinite resource and explore new manifestations in Zentangle Art. When I began tangling flux, my shape smoothed out and became leaf-like. (Maria and Molly teased me that it i should call it "tongues"!) 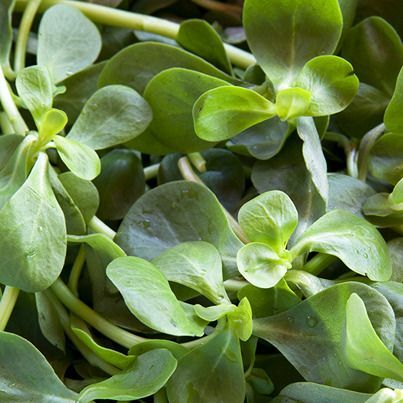 This shape reminded me of the purslane herb that I used to grow when I kept a garden. Remembering my purslane, I added a middle line a dot or two. Both versions can be done "flat" or layered in a hollibaugh fashion. What does your flux look like? Please see this blog post for larger views of this article's images. 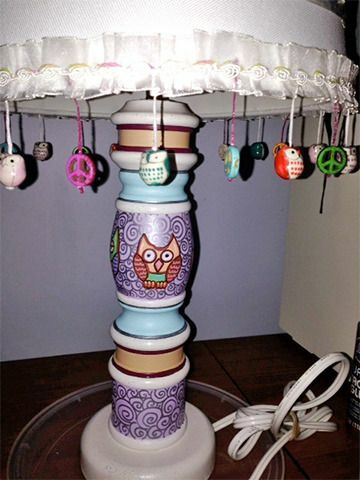 In reply to your question, "What have you tangled recently" in your recent blog post that included your beautiful tray, I am sending a photo of a lamp I recently tangled for my niece. A while ago you had a blog post about tangling on a silver tray and you asked what kinds of unusual things others tangle on. Well, I personally love trash. A couple of favorite things I have tangled on are the stays that you find inside a pair of new shoes. (sketchers has the best). The kind of things that just get thrown on the floor for others to pick up . . . well I pick them up! 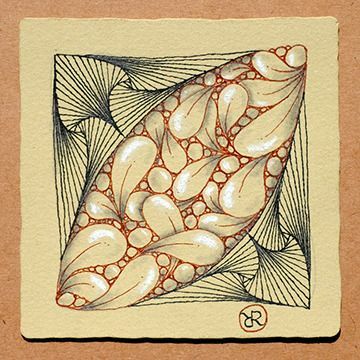 The one in Renaissance colors I did while sitting in on my friends Launie McDevitt and Lisa Ruschman's Zentangle 101 class (both wonderful teachers (CZTs) and tanglers). But mostly my days are filled with strips and strips of paper tape. I work in a hospital and when i have downtime I grab small rolls of 3M papertape and I tangle. It has become an important ritual to my day. It keeps me sane in a very stressful setting and people are always bringing me bits of "trash" to tangle for them. I can't begin to thank you for the great medium you bring to people. It has me being creative everyday. 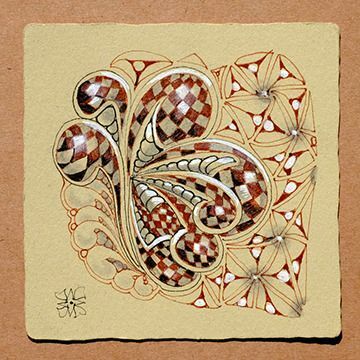 I just wanted to say I have now received my second order and both times there was just as much care put into the packaging of the item ordered (this time the Bijou tiles - so excited) as the item inside. Thanks for making the simple process of opening a package like Christmas! I will be ordering more in the very near future! --D.D. 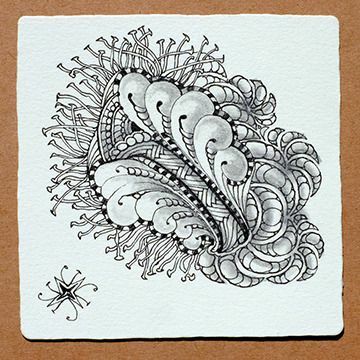 I am new to Zentangle, and like so many others, I'm instantly addicted. I purchased your kit with two goals in mind. 1) Rekindle my creative side. 2) And have easy, mobile, mental, creative distraction for the post operative period of my impending knee replacement. Well I got my kit, read the book, watched the video and was hooked, I've been doing it daily, I took it to hospital as a form of distraction to the pain. I take it to appointments to help pass time. I do it after therapy to take my mind off the pain. 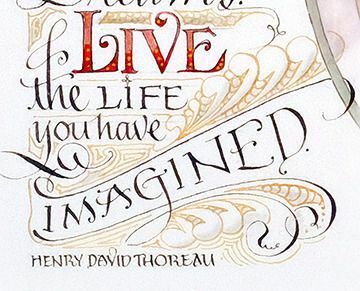 Like most, I doodled as a teen, and any time I found myself idle with a pen in my hand. I've always been like a bumble bee, but now I sit with a polar ice machine attached to my leg. So thank you for this wonderful gift. -- T.H. We had so many great comments on our last 2 blogs. Thanks to everyone for taking the time. 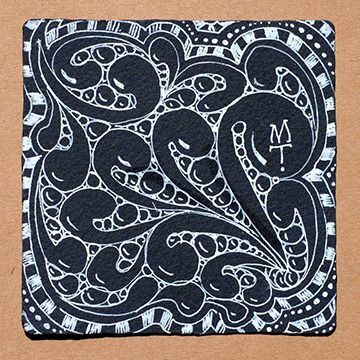 Please send your snail mail address to Maria at maria [at] zentangle [dot] com so we can send you your present! In an earlier newsletter we announced, in association with Sakura of America, a scholarship program to attend a CZT training this year. We are happy to announce that Deborah S. of Arizona will join us at one of our next seminars as our guest. We are all looking forward to meeting her and getting to know her. 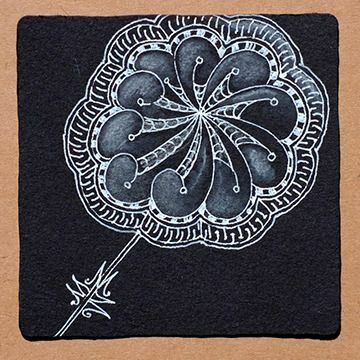 Life happens and we have three shared room spaces just opened up for our next Certified Zentangle Teacher (CZT) training seminar April 12-15, 2015. Please contact Martha if you are interested. For more information on this program, visit this link. Thank you again to all for sharing this wonderful adventure with us.